Hi Penny! Thank you for including my Award Winning Chili recipe in your cookbook! Another chili cook-off is coming up on August 11th - haven't decided what kind of to make yet. 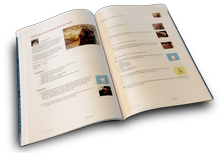 There's lots of great recipes in your cookbook (and all in one place) - I'm gonna take a serious look at it! Thanks again!